Whole30 Days 21-23: Oh, come on. Pure chocolate torture, via Hershey’s. When I decided to do the Whole30 from March 12 to April 10, I thought I’d found the only 30 days on the calendar that didn’t include a major holiday or big family event. I figured that if I avoided the big temptations – fried chicken, Granny Myra’s Mexican cornbread, birthday cake – I’d be halfway home. The timing has definitely worked for me, except for one huge miscalculation. 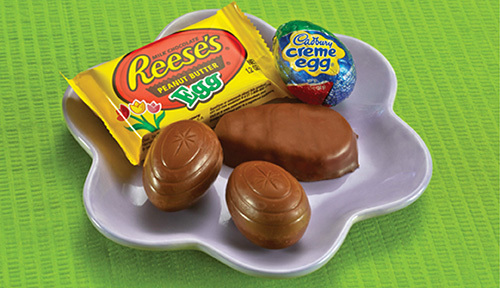 Look, I have been avoiding the Easter aisle like it’s jammed with diseased, poop-hurling monkeys, but now there are strategically-placed Reese’s peanut butter eggs everywhere – greeting you at the front door, waving from the end caps, flashing you at the cash register as you leave. The monkey is on my back, and he smells like Cadbury mini eggs. So I’m playing little games with myself. When I crave chocolate, I think about Easter candies I really hate, like cream eggs. And jelly beans. And Peeps (except for blowing-up-in-the-microwave purposes). I tell myself that that stuff would probably be way too sweet for me now (which is probably true) and that, when I’m ready to break my chocolate abstinence, it should be with something special (which is definitely true). Anyway, this has me feeling a little like Cathy (chocolate! ack! ), but everybody’s got their something. Note: Breakfast is always two eggs with sautéed onions, bell pepper strips and mushrooms, plus a banana or an apple. Lunch: Barbacoa meatballs with guacamole (minus the cinnamon). Dinner: Fajita-spiced chicken with onion, bell peppers strips and mushrooms. Lunch: Fajita-spiced chicken with onion, bell peppers strips and mushrooms. Dinner: Grilled pork chop with a baked sweet potato and small salad. Dinner: Salad with chicken, toasted pecans, dried cranberries, mixed greens and homemade raspberry vinaigrette. Previous Post Whole30 Days 16-20: BrrrZap!